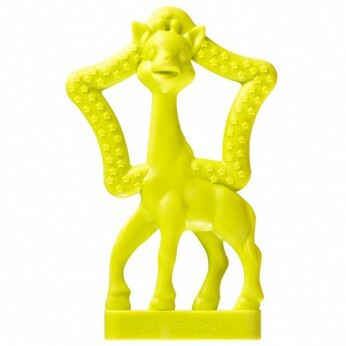 A soft and supple ring in the shape of Sophie la Girafe, with a delicious vanilla scent. Multiple parts to gnaw and a textured surface to gently massage the gums. Lightweight, and with a star-shaped ring, designed for little hands. This toy costs approximately £3.99 (for the latest and best prices make sure you check our retailer list for the Sophie the Giraffe Vanilla Star Teether above). In our review of Sophie the Giraffe Vanilla Star Teether we classed it as being suitable for ages 0 to 11 months but recommend you check the manufacturer specific advice before purchasing.